At the invitation of the Conference organizers, SPRINT Robotic Collaborative (www.sprintrobotics.org), at the 1st Inspection & Maintenance World Robotics Conference held in Galveston (TX), USA, on 13 and 14 November, Dietsmann’s New Technologies Director shared the Company’s vision on how the industry might look when reliable and safe Inspection and Maintenance robots enter service. 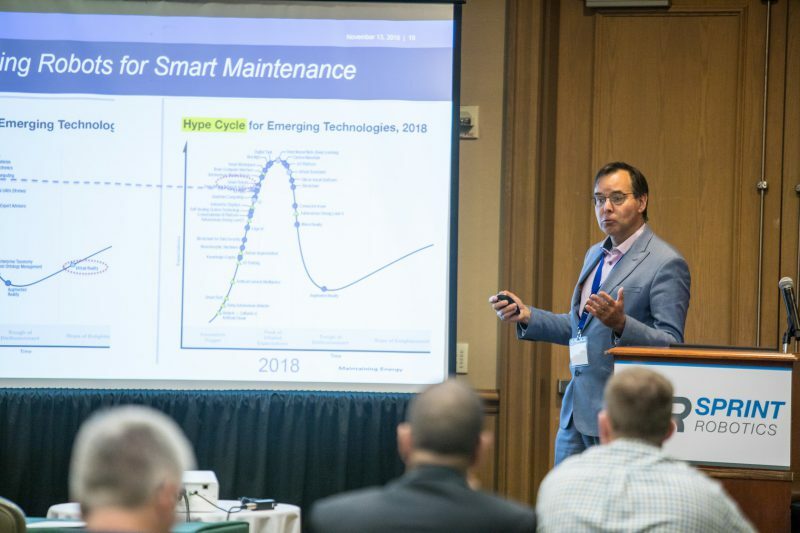 The expectation, Duco Drenth explained, is that the application of new technologies will transform the Operation & Maintenance (O&M) of oil, gas, chemical and/or mining assets by enabling safer and more cost-efficient maintenance. One promising example is the introduction of Remote Operating Robots (RORs) that can execute certain O&M tasks, such as routine inspection, gas/leak detection, location screening/roaming, repetitive (minor) tasks, cleaning, and manipulation (for example of valves and switches), as well as pro-active handing in the case of emergencies. The ROR would carry out its tasks while moving either semi-autonomously or fully autonomously around a specific area within a dedicated industrial facility. The Sprint Robotics Roadmap, issued in 2017, includes an indicative forecast of these applications along with the associated Technical Readiness Levels (TRLs) and Business Readiness levels (BRLs). In his presentation Dietsmann’s New Technologies Director revealed to delegates that a number of applications have been identified. Providing certain technological developments can be realized and specifications are fulfilled, the ROR could, for example, be deployed either as a ‘single’ solution or in a ‘multi-robot’ ecosystem. He explained that a recent assessment process identified several important areas which will need further industry-wide focus and cooperation. Standardized Communication protocols (e.g. WIFI, 4G/LTE, 5G), and ATEX or IECeX-readiness & certification are important issues, as are the standardization of tasks, the type of operating mode (tele-operated vs. autonomous) and certain safety aspects. Duco Drenth concluded by summarizing the current status in respect of RORs, the required conditions and the expected timeframe for their deployment in challenging industrial environments.